Vertical Contract Manufacturing of the Mechatronics Group of Companies is a custom wire, cable harness, and box build manufacture. We specialize in building custom assemblies to your specifications. We believe our customers should have a supplier that they can place their order and forget about it. Your product will show up on-time, built to your specifications, and ready to be plugged straight in to your device. 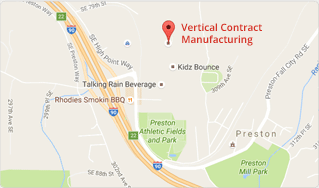 Vertical Contract Manufacturing (VCM) uses the latest in high tech equipment to produce your products to the very best and highest standards. Our state of the art tooling and production facility allows us to provide the most efficient and quality parts to our customers. VCM, as part of the Mechatronics Group of Companies, is integrated with a multitude of inventory and delivery options; we capitalize on our cross functional work-force and 65,000 square feet of operating space to realize and deliver on our customer needs. VCM, with over 35 years of combined expertise, provides the assurance that your product is built to and meets all industry requirements. The Mechatronics Group of Companies provide Value Driven Solutions to customers throughout the world, large or small, across a multitude of industries. We are passionate about partnering with our customers to solve their problems and help them exceed their goals. We are a key supplier to several Fortune 500 Corporations with top supplier awards, as well as a critical partner to our small business customers. We believe that communication, understanding your issues, risks, concerns, and goals allows us to build trust and create a Partnership for Success! If you are ready for Value Driven Solutions for your supply chain, please contact us today. VCM looks forward to earning your business and becoming a valued partner to your supply chain.